Looking for a book full of humor to relieve the winter doldrums? The Accidental Further Adventures of the 100-Year-Old Man may be the book for you. I’ll admit, I have not read the first book The 100-Year-Old Man Who Climbed Out the Window and Disappeared, but I want to after reading this. Allan Karlsson is a Swedish 100-year old man living a life of luxury in Indonesia with his friend, petty thief Julius Johnsson. They are using a briefcase full of cash they found (probably in the first book). As the cash runs out, they are wondering what their next adventure will be. At Allan’s 101st birthday party, they accidentally set sail over the ocean in a hot air balloon. They are rescued after they go down by a North Korean freighter carrying grain and uranium back to North Korea. Allan has had run ins with North Korea in the past and decides to bluff his way through as a nuclear arms expert . . . which is the start of a very complicated diplomatic crisis! How will Allan and Julius survive this adventure? I’ll admit with the Government shut-down and everything, the last thing I wanted to read was political humor where President Trump was a key player . . . yet this book really drew me in and kept me reading and laughing. Especially as the humor was so pointed and only too true (see my favorite quotes below). Although I’ll admit on the other hand it made me sad to really realize that our country is the laughing stock of the world (the author of this book is Swedish and lives on an island off Sweden). I was happy that other countries and their leaders were mocked as well. Do you like political humor? What books make you laugh? 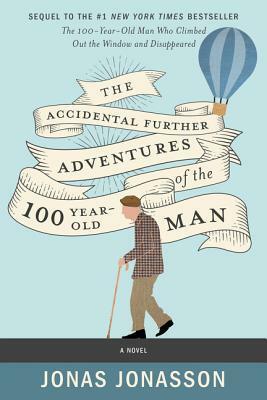 Overall, The Accidental Further Adventures of the 100-Year-Old Man by Jonas Jonasson is a funny, very on point to today’s headlines, adventure. I need to read more from this author. For more stops on the TLC Book Tour and more information about this novel check out this link. Laura, I''m glad you found this book funny and timely. I enjoyed your book review, as usual, as well as the quotations you featured from the book. We have politics discussed disseminated in minute detail daily here in my part of the world. Nothing happens. Everything continues as before. I don't like political humour!!! I have enjoyed political humor my whole life, but politics these days has begun to tire me out! I still found this book enjoyable! I've enjoyed a few things lately that I've sworn I don't like, so even though I've never enjoyed a political humor book in the past, this one sounds good! I can enjoy good humor, regardless.